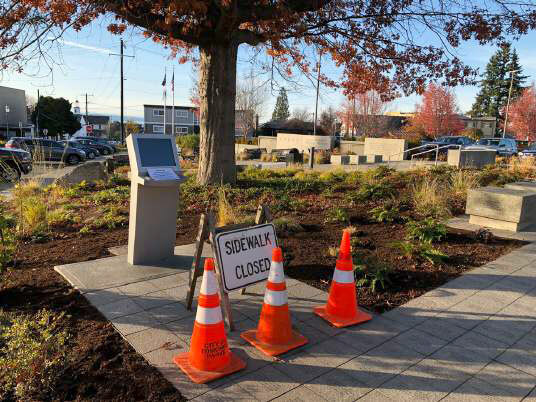 The Edmonds Veterans Plaza continues to develop as the installation of an outdoor interactive kiosk was completed by the City of Edmonds early this month. As you can see from the photo, the kiosk is located adjacent to the dedicated pavers walkway. All that remains is to install the necessary software to allow functionality, which should happen later in November. A dedication ceremony will be planned as soon as the kiosk is functional. This device is intended to give veterans and their families easy access to information about veterans aid programs and will eventually offer a list and location guide to all of the dedications located within the plaza. Donations are being accepted for additional pavers, purchase and installation of which will be scheduled as soon as a sufficient quantity have been ordered.